SPRING VALLEY – Monte Vista High senior DERRICK WILEY turned quite the double play on Friday. The Monarchs’ left fielder scored a run in the Monarchs’ 13-0 win over visiting El Cajon Valley in a Grossmont Valley League baseball game in the afternoon. 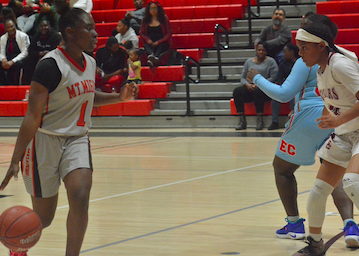 Then Wiley, along with a couple of dozen other East County prep basketball players, hit the hardwood one last time later that night at Mount Miguel High for the Bill Dickens Boys and Girls Senior All-Star Basketball Games. 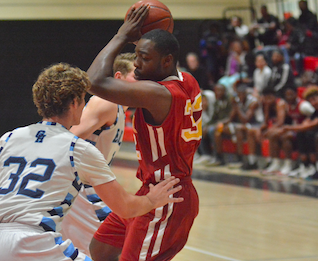 Mount Miguel’s MARQUISE EDWARDS, the Grossmont Hills League’s Player of the Year, won game MVP honors as the South defeated the North, 93-84. Before the game, Edwards threw down a couple of jams hand took away the title of Slam Dunk Contest champion, as well. But the best dunks by far were in the actual game itself. South All-Stars D.J. 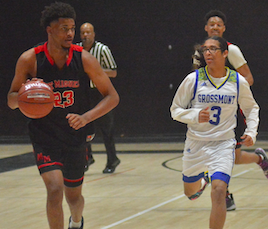 CARTER-HOLLINGER, of Foothills Christian, and DAEVION ROGERS, of El Cajon Valley, were among those who threw down several jams. Carter-Hollinger is the top college prospect to appear in the contest since Grossmont High’s TOMMY RUTHERFORD, now at UC Irvine. Carter-Hollinger is headed to the University of Montana. Monte Vista’s SARA TAHA hit the game-winning shot in the girls’ contest and was the North team MVP. Taha’s squad won, 65-64. Mount Miguel’s TIAJA BENNETT was the South team MVP. 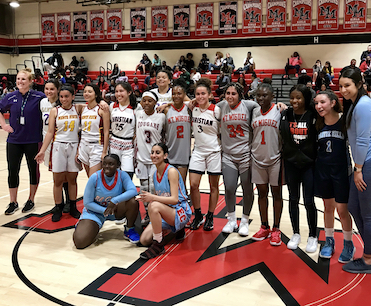 The three-point shooting contests were won by the two players that were likely considered the favorites to win – Mount Miguel’s LALLI GURROLA and Valhalla’s DOMANIC SAFARTA. 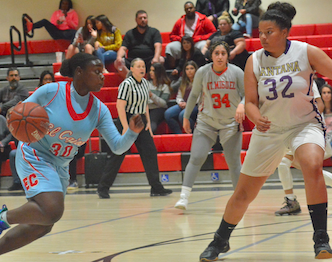 Gurrola just got her last shot off before the buzzer to out-duel Christian sharpshooter YESENIA SMITH. Safarta also was the North team MVP in the game. A poignant moment came between games when Helix basketball coach BRENNAN CASSADY was honored for his brave fight after a devastating illness that included a stroke and a brain tumor.